Munching on your cannabis can have some profoundly different effects to smoking it, and here is why. Have you ever wondered what it is about eating marijuana that makes it so much more potent than simply smoking it? Putting your pot in a brownie instead of a joint can magnify the experience in terms of both power and length – often to the delight, but sometimes to the dismay of the user. Eating Vs. Smoking Cannabis: How The Body Reacts! Ingested cannabis is a force to be reckoned, and can easily overwhelm the unprepared. The reasoning behind all this comes down to the way the compounds of cannabis interact with the body. When you eat cannabis, it has to go through the digestive system. During the process of absorption, THC passes through the liver, where it is converted into a much more powerful form. Delta-9 THC (normal THC) becomes 11-hydroxy-THC, which can pass the blood-brain barrier with much more ease and a much stronger punch! When you inhale cannabis, either in the form of smoke or vapor, the compounds are absorbed directly into your blood through the lungs. This causes the THC to bypass the liver, and head straight for the brain, resulting in a much more instantaneous, but less powerful high. It is worth noting that when you smoke weed, the THC that doesn’t make it across the blood-brain barrier on the initial pass gets a ride through the bloodstream as it makes its way back around the body. On its journey, it will come to the liver, where, much in the same as when you eat it, it will be converted into 11-hydroxy-THC. This causes you to feel the effects of both forms of THC, once it makes its way back around to the brain. The main difference between eating and smoking, is that ALL of the THC you consume when eating is converted into 11-hydroxy-THC, whereas only a portion of the THC from smoking is. Then there is the aspect of dosage control. When you eat marijuana it is all in your system at once, and there is little you can do to control dose since it takes so much time until the effects are felt. When you smoke marijuana, you get an instant reading on how it is effecting you, and control the continued dose accordingly. This is technically called titration: Controlling and adjusting the potency as you go along. Smoked cannabis tends to peak in strength after 10 minutes, and then rapidly dissipate over the next 30 minutes to an hour. So through titration, you can keep yourself on a level over a period of time. This is not possible when you eat marijuana, you get it all in one go. However, as you get to know your stash and the strength of your preparation you can get a very accurate feel for the dose and use it very accurately. To achieve this, always measure out how many grams you’re ingesting, that way you can easily determine which range suits you. When it comes to dosing, it is advisable to stay on the low side when experimenting, as even small amounts can be surprisingly strong. If you don’t know the potency of the material, start out with 0.3g or 0.5g of bud and take it from there. Measuring how long THC stays in the body is actually quite complicated. The measurement used to assess how long a drug stays in the body is called a half-life (how long it takes half of the substance to leave your blood), but as THC can be stored in fat and then rereleased, it is a hard measurement to take. Saying this, what it all boils down to is how THC is metabolised. If THC does not pass through the liver, it dissipates very quickly, whereas if it does, it can hang around from anywhere between 6-10 hours. This means if you eat marijuana, and get a pure dose of 11-hydroxy-THC, you will be high for quite a while. The final factor to look at is onset. 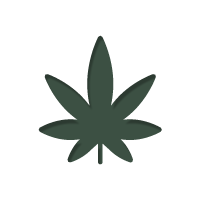 When smoked or vaporized, the effects of cannabis will set in rapidly, sometimes almost instantly. However, when you eat it, it can take anywhere between 45-minutes to an hour and a half. This is caused by two major differences. The first is that when you smoke weed, it gets into your blood instantly; all it has to do is make its way to your brain. When you eat it, the cannabis has to first make its way through your digestion system, before finally making its way into the blood and then brain. Secondly, it also comes down to concentrations. Smoking cannabis actually puts a lot more THC in your blood than eating does. About 50-60% of the cannabinoids inhaled make their way into the bloodstream, whereas only 10-20% of those eaten do. This makes the onset of ingested cannabis much slower. Every substance has its sweet spot in which it unfolds its effects in the most beautiful form. Going beyond that spot doesn’t always increase the pleasant aspects, but more often brings out the unpleasant sides, such as anxiety or a racing heartbeat. Cannabis isn’t commonly considered a psychedelic in the same class as magic mushrooms or LSD, but nonetheless, even smoking highly potent weed can certainly lead to first stage psychedelia. Is It Possible To Hallucinate From Smoking Or Eating Cannabis? But when eaten, this tends to be amplified significantly, and the effects can take on the characteristics of a trip: Long duration (4-6 hours) and mild visionary quality, albeit commonly tainted by sedation and heavy limbs, as wells a fits of laughter and the munchies. Besides needing much less material to achieve a long lasting effect, eating cannabis brings out its psychedelic nature a lot more than any other form of consumption. For tons of great cannabis recipes, check out the Stoney Youtube channel. For example, why not try Weed Oreos, a Zamnesia favorite!